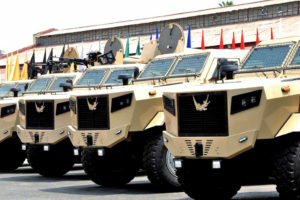 The Tyron All Terrain Rubber Runflat (ATR) has been extensively trualled on the Egyptian Timsah or Crocodile 4×4 armoured vehicle. The rubber ATR reduces the logistic burden and enables the vehicle continue with its mission by locking the tyre onto the wheel and by reducing vibration.Rubber runflats trialled by the Egyptian Defence Forces on their Crocodile or Timsah 4×4 are on at the centre of the Tyron display on stand 2600 in Hall 2 during EDEX being held in Cairo from 3 to 5 December 2018. The All Terrain Rubber runflats are multipart units which makes them easy to change with standard tyre fitter tools wherever required thus reducing the logistical burden associated with other type of rubber runflats. “We have developed our All Terrain Rubber runflats based on conversations with both vehicle OEMs and the end user, in both cases they have told us they want something that enables the vehicle to continue moving at speed, reduces the logistic tail whilst giving the crew and passengers as comfortable ride as possible,” said Tony Glazebrook, Technical Director of Tyron Runflats. The use of rubber versus composite materials reduces the vibration and stresses that are transmittable through the runflat to the wheels, axles and drive shafts allowing the vehicle to continue with its mission with little change to the handling whilst retaining some comfort for the crew. Rubber also has the benefit of ensuring beadlock so that in the event of a puncture the wheel stays locked onto the wheel. This is possible because rubber is a malleable material which can be moulded to fit in a space. Tyron’s runflats are slightly larger so that they really grip the tyre something that can only be done with rubber. A hard composite needs to be manufactured to an exact size and if there is any error on the beadlock on the tyre then the chance of losing beadlock increases.